First thing this morning we got hauled out. Hardly any barnacles, a bit of scum, not bad. We told they guys to pressure wash her and to not worry if some of the white hull paint comes off while they are getting the waterline as we are repainting the hull. 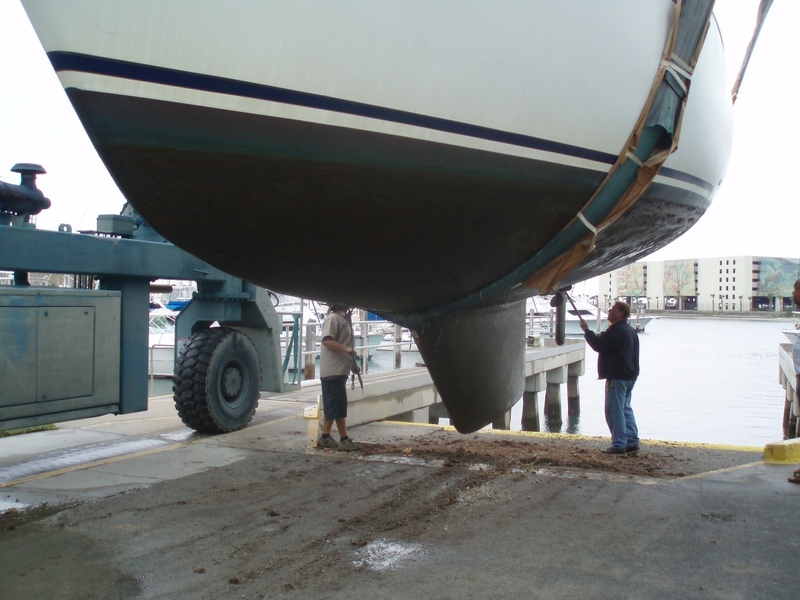 We then drove home to drop off the dog, pick up cars, grab the ladder……On the way back to the marina, we get a call from the yard manager asking us to come take a look before they proceed with the pressure washing. Uh, that doesn’t sound too good. Maybe they just didn’t hear us when we said we weren’t worried about the waterline paint. We pull up and see a somewhat nervous yard man who was quickly explaining he was only trying to get off the scum while he showed us a section of our hull that just peeled off. We reassured him that the peeled area wasn’t his fault. And because our super scum wasn’t budging with just the pressure washer, we let him hit it lightly with the sandblaster just enough to get clean. After getting the boat blocked we started picking at the area that peeled. Yep, there was no need to worry about removing the scum. 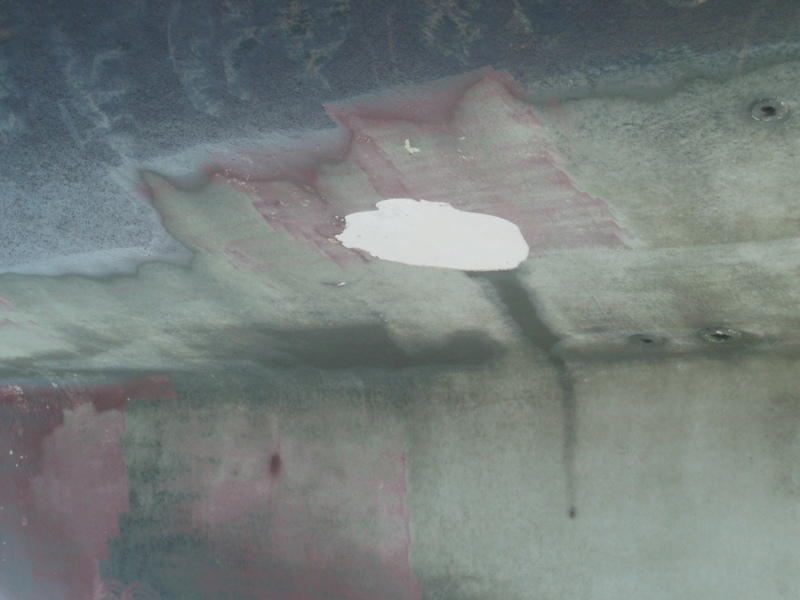 With a simple scraper, we began removing large sheets of the bottom paint/under coating. Right down to the bright, shiny, never-even-sanded white gelcoat. 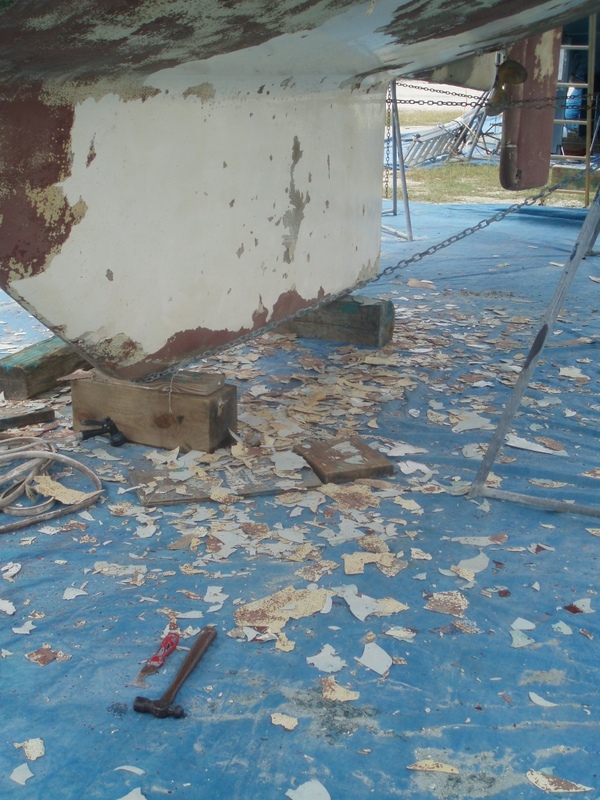 The previous owner had stripped the old bottom paint and applied the primer coat before we bought the boat and we have always wished we had had a chance to see the bare hull first as he didn’t have photos. After seeing (and redoing) most of his other projects, we were a bit worried about his prep work. Turns out, I don’t think there was any prep work. Guess we should have trusted our instincts and sanded it off while it was in our back yard. Oh well, we will get to see the bare hull (which looks pretty good so far-a few small blisters) and prep and paint it ourselves and in the end that is a good thing. But I think my little schedule for this haul out can be thrown in the garbage. Keith was right, It won’t go the way I planned. Nice little surprise. At least now it’ll be done right.